Graham Kerr (born January 22, 1934 in London) is a famous cooking personality who gained fame through his cooking show The Galloping Gourmet. Kerr grew up in England where his parents were established hoteliers. As a result, much of his childhood was spent amongst some of the most salient chefs of Europe. Educated at Brighton College, he became trainee manager at the Roebuck Hotel in East Sussex, England aged just fifteen. After five years in the British Army as catering adviser, Graham became General Manager of England's Royal Ascot Hotel. It was not until after a brief stint in New Zealand as chef catering adviser for the Royal New Zealand Air Force that Graham established his alternate television persona "The Galloping Gourmet". 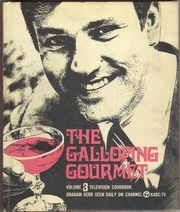 Filmed in Canada and produced by his wife Treena Kerr, The Galloping Gourmet was known for its light-hearted humor, tomfoolery, and the copious use of wine, clarified butter, cream, and fat. Indeed, Graham's most famous line on the show might have been his response to someone's criticism of his cooking: "Madame, you could go outside and get run over by a bus and just think what you would have missed!" Graham also liberally featured wine, serving it with most meals, drinking it while cooking, using it in his dishes, and waxing poetic about its virtues. During The Galloping Gourmet's successful run, Graham became a worldwide sensation, wrote a plethora of cookbooks, and earned two Emmy nominations. The show ended in 1971 after a tragic car accident that left Graham temporarily paralyzed. After his wife Treena's heart attack in 1986, Kerr was prompted to create a new style of cooking that he dubbed "Minimax". This new food stressed aroma, color, texture, and taste over fat. Minimax led to two successful cookbooks: Graham Kerr's Smart Cooking and Graham Kerr's Minimax Cookbook along with corresponding series on the Discovery Channel and Public Television. By this time a recovering alcoholic, Graham had also given up wine and exclusively used a dealcoholized version on his new shows. In 1995, he appeared in a PBS special with Julia Child called Cooking in Concert: Julia Child & Graham Kerr. In 2003, Graham Kerr received an honorary doctorate for culinary arts and nutrition. Kerr, G. (1967). The galloping gourmets. New York: A.H. Sydney & A.W. Reed. Kerr, G. (1969). The Graham Kerr cookbook, by the galloping gourmet. Garden City, New York: Doubleday. Kerr, G. (1972). The complete galloping gourmet cookbook. New York: Grosset & Dunlap. Kerr, G. (1976). The new seasoning. New York: Simon and Schuster. Kerr, G. (1978). The love feast: How good, natural, wholesome food can create a warm and lasting Christian family. New York: Simon and Schuster. Kerr, G. (1991). Graham Kerr's smart cooking. New York: Doubleday. Kerr, G. (1993). Graham Kerr's minimax cookbook. New York: Doubleday. Kerr, G. (1994). Graham Kerr's kitchen. New York: G.P. Putnam's. Kerr, G. (1995). Graham Kerr's best: A low fat, heart healthy cookbook. New York: G.P. Putnam's. Kerr, G. (1996). Graham Kerr's swiftly seasoned. New York: G.P. Putnam's. Kerr, G. (1997). The gathering place: Informal international menus that bring family and friends back to the table. Stenwood, WA: Camano Press. Kerr, G., & Suzanne, B. (2004). Graham Kerr's simply splenda cookbook. Alexandria, VA: Small Steps Press. Kerr, G., & Kerr, T. (2004). Charting a course to wellness: Creative ways of living with heart disease and diabetes. Alexandria, VA: American Diabetes Association.